Orthopedic Gevavi clogs imported from the Netherlands! Gevavi clogs are a lot used on farms with gardening or any outside work. 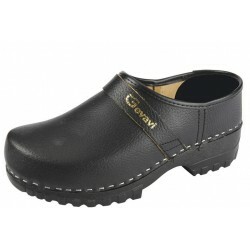 The Gevavi Dallas orthopedic clog is a very comfortable work shoe with grained, 100% cow leather cover. Wooden insole and PU outsole. Particularly resistant and equipped with anti-sprain tabs. Avoiding dirt profile.